Comments Off on Eventful Road Trip! 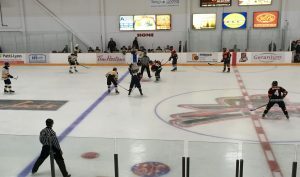 The Bruins travelled to Wasaga Beach for an exhibition game on Sunday to face the 2017/18 North Conference Champions, Stayner Siskins. The boys were able to soak up some sun while they waited on the side of Hwy 9 after the bus broke down. After an hour delay another bus arrived and we were able to make it just before puck drop! Despite missing warmup, the Bruins maintained a lead for majority of the game. 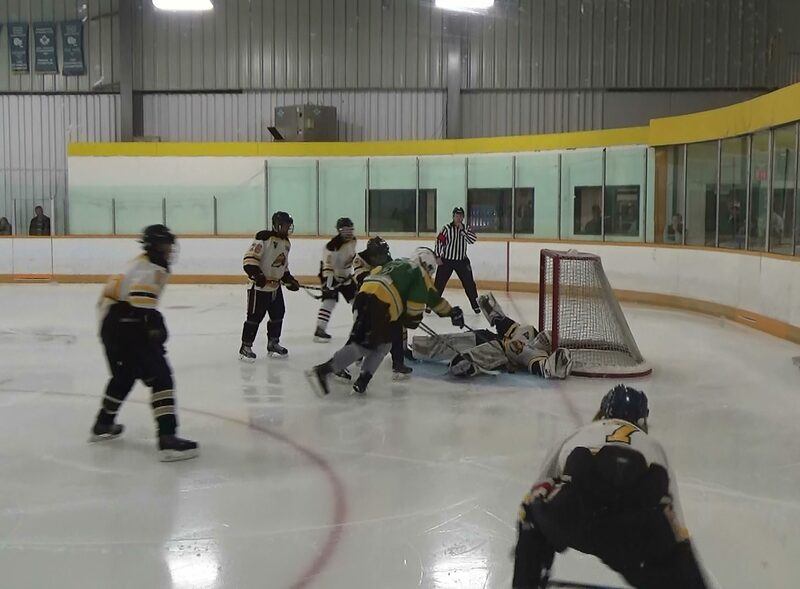 But the Siskins evened things up late drawing a 4-4 game after 60 minutes. No OT is played during exhibition play. Rookie Daniel Giorgio netted the first two goals. Other goals coming from Cameron Moffitt and Justin Bennett, while Jacob Gordon stood between the pipes. Next exhibition game is on Friday August 31st against the Little Britain Merchants in Stouffville. Bruins win game 2 of home and home exhibition games against Midland Flyers. The boys battled back from a 2-1 deficit and came out on top 5-3. Simon Feig (video) scored the Bruins first goal after splitting the Flyers D and beating the tender’s poke check, finishing it off on the backhand. Other goals coming from Daniel Giorgio, Nolan Kellachan, Brendan Davis, and Robert Freckelton. Camp continues this week in Stouffville. 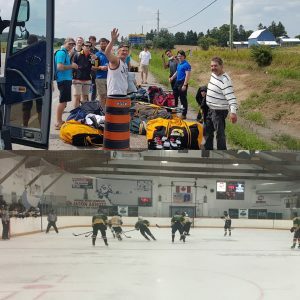 Next game is in Wasaga Beach versus the Stayner Siskins on Sunday August 26th. Bruins win 5-0 against the Midland Flyers on Friday night in Stouffville. The boys played a fast paced physical game. 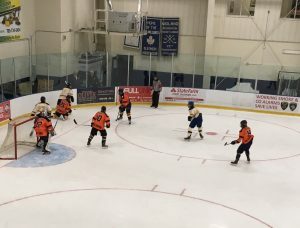 With the first goal of the season coming from newly acquired Jackson Savery (Video) with a beauty snap shot from the top of the circles going bar down. Other goals coming from Simon Feig, Michael McCue, Noah Donaghy, and Nick Sribny. Sharing the Bruins shutout was Ryan Greenly and Jake Gordon. The Bruins travel to Midland on Sunday afternoon for the second game of the home and home series. Comments Off on Welcome back to the Den! Welcome back to the Den! Forwards Robert Freckelton, Cameron Moffitt, and Noah Donaghy. Defencemen Nolan Kellachan, and Adrian Addante. Also, adding gritty forward/defenceman Daniel Giorgio from the AAA Markham Waxers. Comments Off on Latest Bruins! We are please to announce the following acquisitions. and from the Newmarket Hurricanes Jr A power forward Jackson Savery. Welcome to the Den boys! Comments Off on (Updated Aug.9/18) Bruins 2018 Exhibition Schedule! (Updated Aug.9/18) Bruins 2018 Exhibition Schedule! 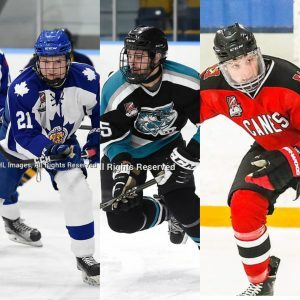 Bruins GM Mark Savery announced today that the Uxbridge Bruins will hold their first preseason game on Aug.17th at 7:30 vs the Midland Flyers. It will be played at the Stouffville arena Pad A. 12483 Ninth Line, Whitchurch-Stouffville. The Bruins will then travel to Midland for a return match on Sunday Aug.19th at 2:30 pm. Here is the rest of the exhibition schedule. Port Hope at Uxbridge (Uxbridge) Fri. Sept.7th at 7:45 pm. Come on out and see the talent trying out for this years edition of the Uxbridge Bruins.